During this week’s Nintendo Direct, Nintendo revealed a new character called Peachette in New Super Mario Bros. U Deluxe. When Toadette touches a crown in New Super Mario Bros. U Deluxe, she will transform into Peachette, which looks like Princess Peach except with some Toadette characteristics. The introduction of Peachette and how Toadette transforms into Peachette has raised many questions among those in the Super Mario community, because it changes the way people think about Toads and Peach. Another Twitter user called PLDH believes all Toads will eventually evolve in something more humanlike, similar to how Splatoon’s Inklings evolved. Another believes Toads and Toadettes are all actually humans, and touching the crown reverses Bowser’s original spell on them. Peachette is Toadette's true form. All Toads and Toadettes are actually humans, but Bowser's original spell that turned citizens into blocks and horsehair plants created the illusion that permanently make them appear as they do now. The power up temporarily reverses the spell. On ResetERA, darker and serious theories about the link between Toadette and Peachette have appeared. 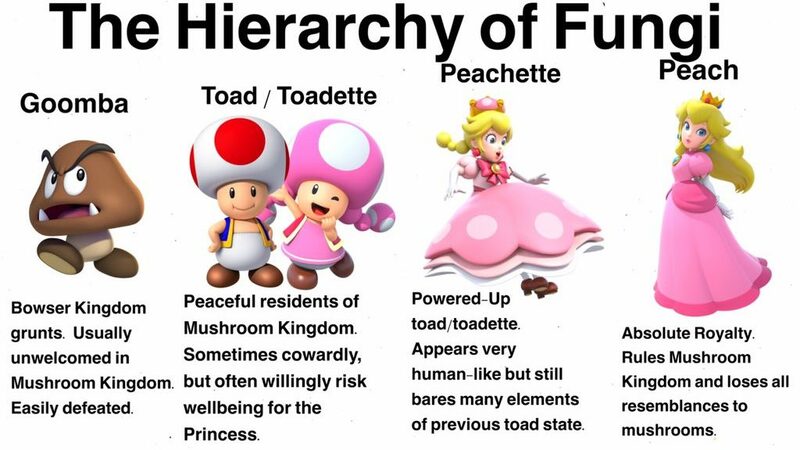 One suggested Peach’s role in the Mushroom Kingdom is akin to a Queen Bee’s role – Peach is the mother of all Toads, similar to how the Queen Bee is the mother of all bees in the colony. Another theory suggested Toadette/Peachette fills in as a Peach double whenever Peach wants to drive karts or play Tennis. There’s also another interesting theory which says every 100 years a Toadette is born in a population of Toads, and Toadettes are destined to rule the Mushroom Kingdom after the current ruler passes away. When that happens, the Toadette transforms into Peachette. What’s your theory? Let us know in the comments below.